I really don’t have a whole lot of pictures from a couple weeks ago when I went to Farpoint, sadly. 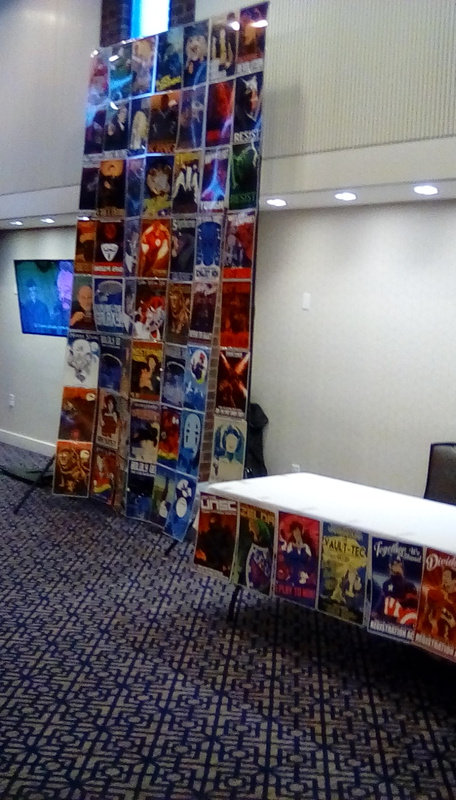 Mainly because my mother gets very lonely and misses us on every weekend where there’s a convention and I’m helping with it. But for the most part, it was a delight to see some of my weird family again, if my blood family is not enough. In fact, I see people from my weird family more often than I see my extended blood family. I only see my uncle Gary and my cousins either once or twice a year, if we can make it to Pennsylvania when Gary is coming from Vermont or Florida, whereas there are more than two conventions every year in Baltimore, and I try to go to the ones I can get in, mostly as staff. Weird has different levels, I found out. There’s the sci fi and light fantasy writer weird (that’s me), there’s weird where people dress in funky costumes (like the bunny guy at all the cons I’ve been to), there’s My Little Pony weird where people wear full pony suits or decorate their rooms with ponies, ponies everywhere and love to have episode fests with other Bronies. And finally, there’s scary weird where people in costume come up to me with their awkward TMI stories and ask to buy me a drink. I try to stay close to the people in funky or pretty costumes who are nice, the sci fi weird people like me, and my boyfriend, who is the “exceptional Brony”, who will all keep me safe from the scary weird people. 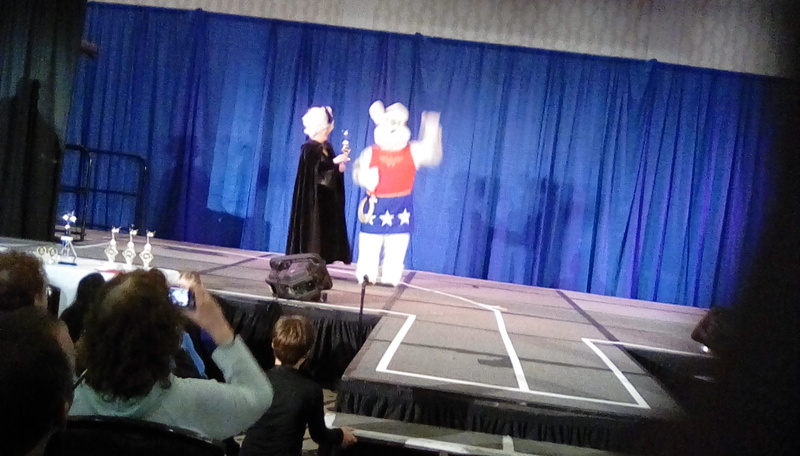 There was also one guy in a wizard outfit who told me a kind of awkward story on Friday night, before he won the Robbie Greenberger Originality award on Saturday. He did this weird little dance to a girly song I can’t remember the name of, and Bob Greenberger seemed to like it. He and his wife Deb have always done the honors of giving the most original award to the winner at masquerade in Robbie’s memory, which I think is a sweet thing since I was one of Robbie’s con friends and fellow con baby born in the same month, the same year. It’s kind of sad to know that if Robbie was alive right now, he’d be 30 years old in July this year. The rest of the costumes were incredible. 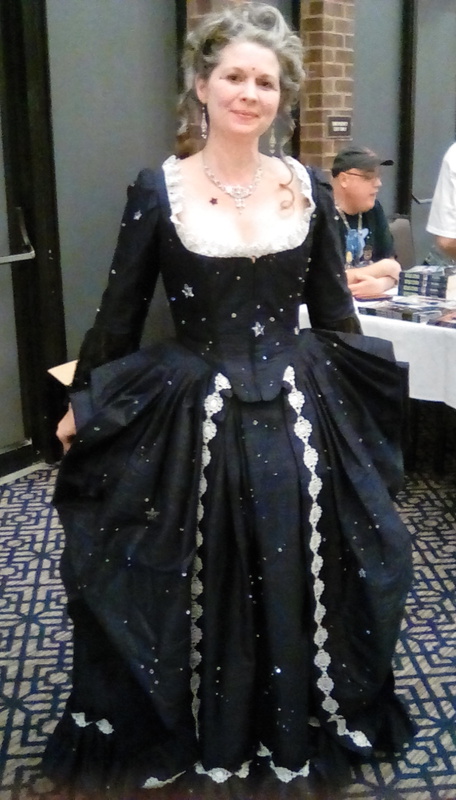 There was a steampunk fashionista, three people wearing the exact same costumes as the Vulcans in the original ST series episode “Amok Time”, and there was a lovely lady in a period dress on Friday night standing next to Keith DeCandido’s table, looking lovely as ever, though she didn’t compete in masquerade. 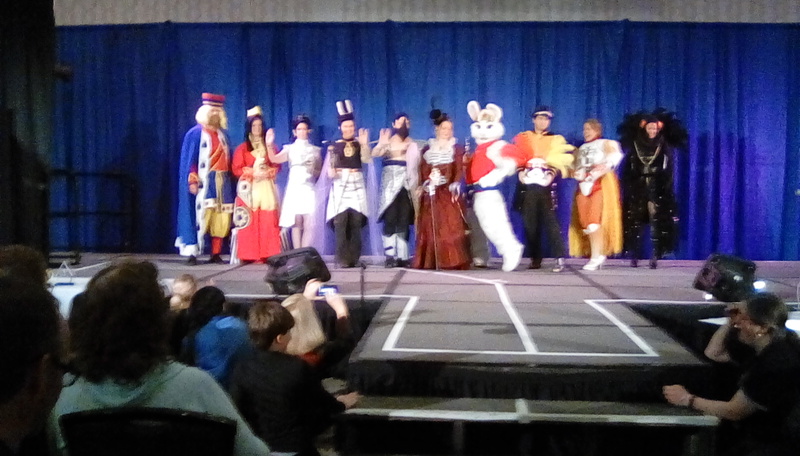 I like that some people like to dress up in costume at conventions and no one has to judge you unless you compete for awards and you adore it when people ask you to take your picture. That’s also kind of why I love dressing up for Ren Fair. 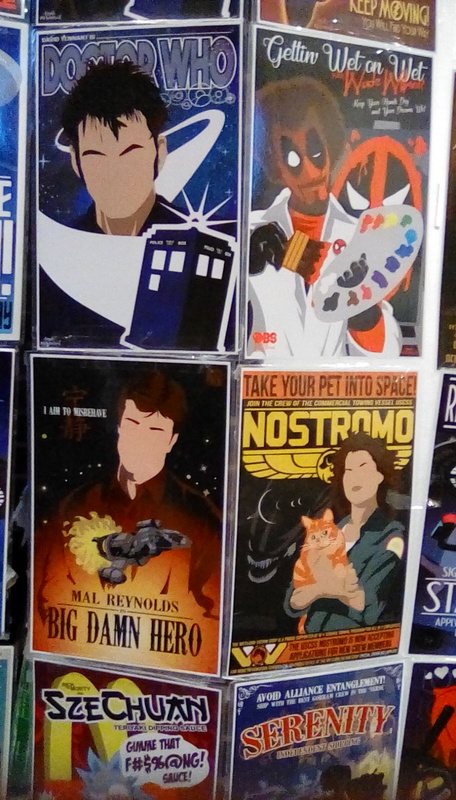 I also noticed something different about this year’s convention: there were these fan made pieces of artwork, looking like posters but smaller, and they were all comical in some way, making fun of Doctor Who, Star Trek, Marvel, DC and Joss Whedon’s Serenity. 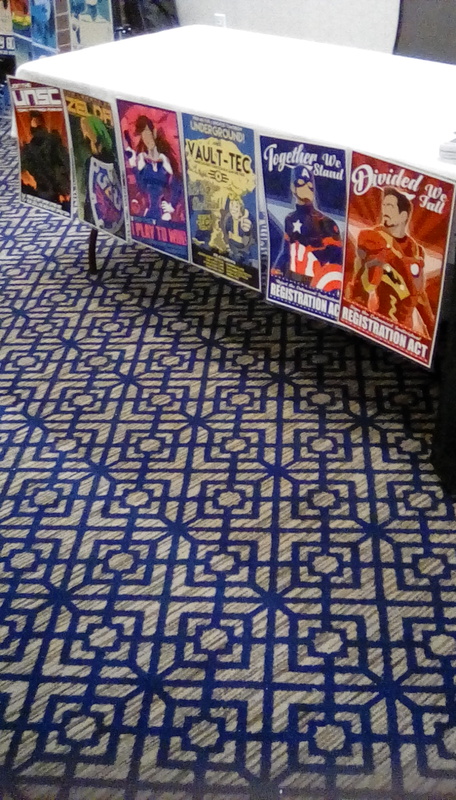 I tried to snap as many pictures of this poster wall art as I could, getting the details in each frame. My costume still isn’t ready yet, which was why I didn’t compete in masquerade this year. 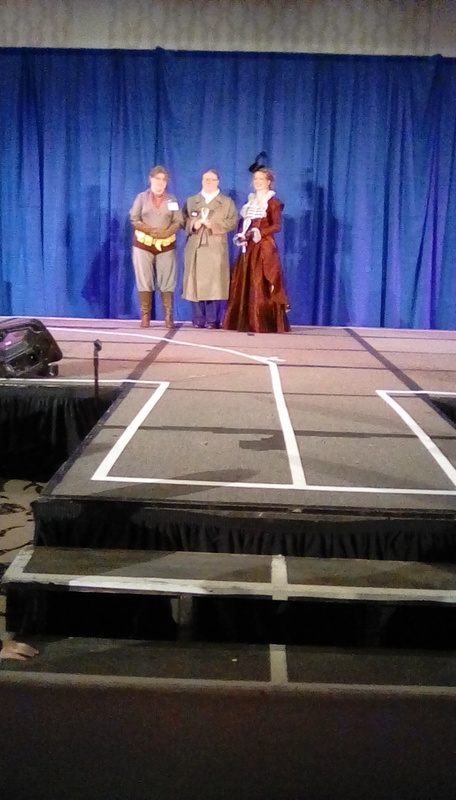 Farpoint was also the convention that moved from Timonium back to Hunt Valley and it was the one time this year that our head of the techies George Lawrence didn’t show. He said he would still be in Ohio all February so he couldn’t make it, and he had to ask my dad to run the entire ballroom all weekend. That meant I had to take Saturday night off from doing anything else and help run masquerade. I was very busy that night. 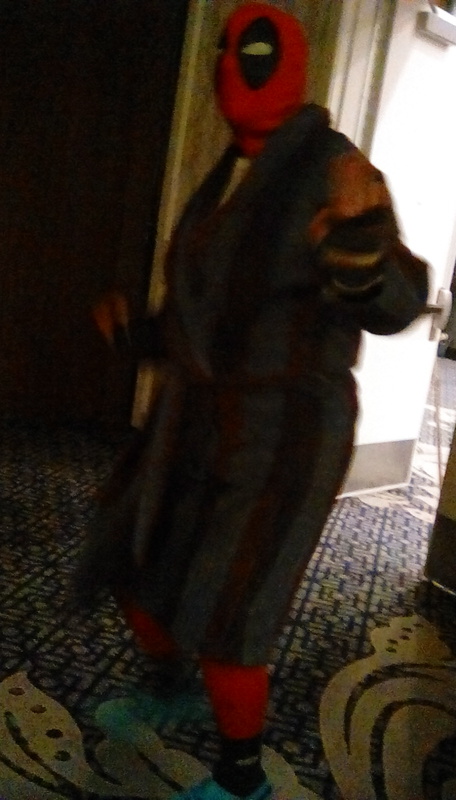 But I promise, I will participate in masquerade at Balticon and maybe Shore Leave 40. This is the year that both Larry Niven and William Shatner are coming, so I am definitely going to be there for both. So far, my crochet costume is still in production, but it is almost finished. It will be ready to wear in May, 2018. But I can tell you right now, the costume itself is coming along really well. It looks gorgeous. I just need to also finish the hooded scarf my mom wants to wear before spring gets here. I hear it’s still going to be snowy weather for the next couple weeks. Deadpool showed up, in his ending cut scene best, like Ferris Bueller. Happy first day of March, sorry for the delay (I haven’t been feeling well from my new medication). Camp NaNoWriMo is only next month and I can’t wait to start a new writing project. My 40 percent off Etsy sale is still going on now until March 14. Please shop on Etsy.com before it expires. I will start a new Etsy sale soon in time for Easter. And if you make a $15 purchase or more in my store C’est Chic Geek Couture, I will go to Water.org and purchase a Stella Artois glass to make a donation to the cause. One chalice will provide people in a developing country, Africa or Asia, with five years of clean water. Keep that in mind. Shop C’est Chic Geek on Etsy today. This entry was posted in Authors, Blog, Conventions, Fiction, Humor, Inspiration, Literature, NaNoWriMo, Nerd, Reading, Science Fiction, Writing, Writing Therapy and tagged balticon, Camp NaNoWriMo, CampNaNoWriMo April, Farpoint, farpoint baltimore convention, Lady in the Blue Box, Rachel Beth Ahrens, rachel beth ahrens fiction and more, rachel beth errands, rachelbethahrens, science fiction conventions, The Nerd Queen. Bookmark the permalink.